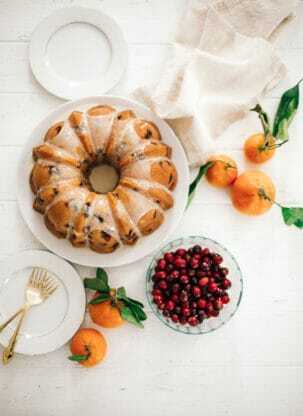 Disclosure: I partnered with Pyrex for this Cranberry Orange Pound Cake recipe post, but all opinions expressed here are my own. I am grateful for authentic partnerships like this. Cranberry Orange Pound Cake – a deliciously moist, flavorful and perfect winter pound cake which is a dream to make all season long. It’s one the best holiday cakes you’ll ever bake! 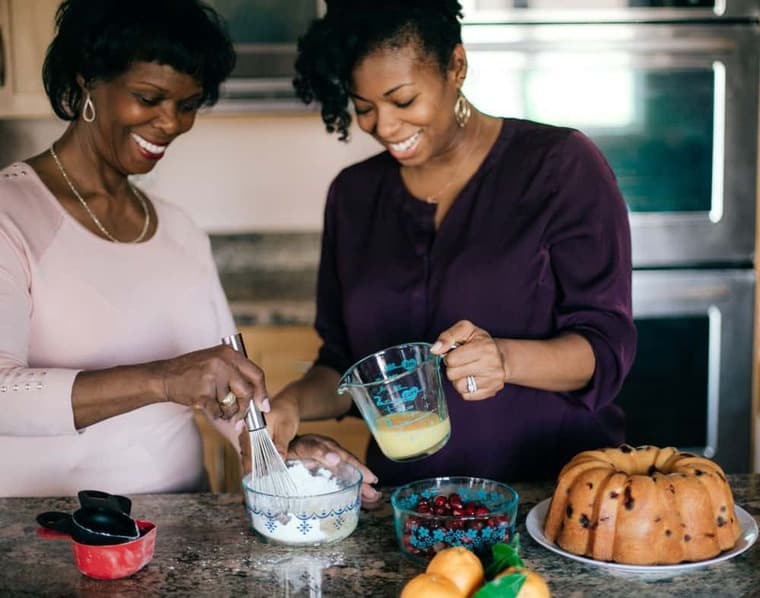 During this time of year, I find myself in the kitchen more and more with my loved ones. There isn’t anything quite as special as baking for loved ones with your loved ones. It gives us a chance to create new holiday memories that I will always cherish. My mother and I have started to share holiday baking as gifts for friends and family. 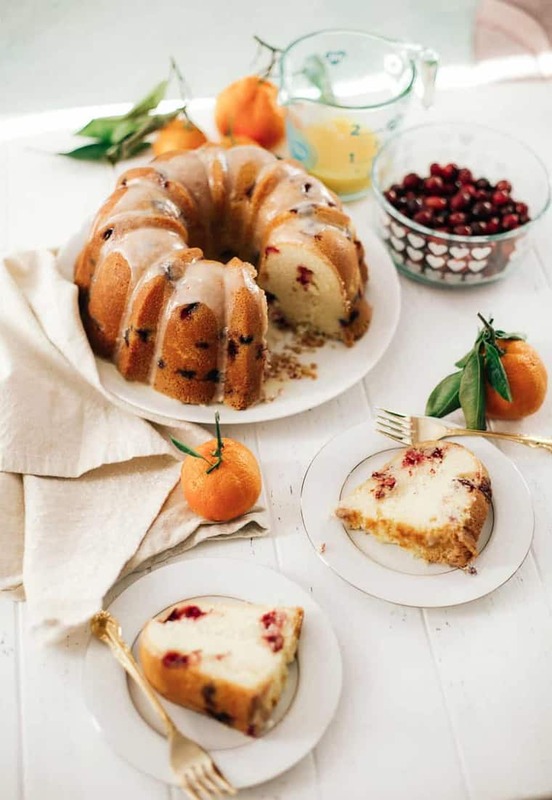 This Cranberry Orange Pound Cake is a gift I’m giving to you! Baking with my mom during the holidays always reminds me of all the times I was in the kitchen with her growing up. 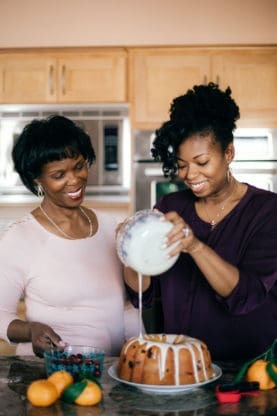 I remember the recipes I would try as she would lovingly supervise and share tips and advice as I would grow into the baker I am now. She first taught me how to make the 7 up pound cake, which was the first cake I ever learned to bake. I can recall that day like it was yesterday. I can vividly see all of the incredible Pyrex dishes in our kitchen that we used for ingredients and storage. Pyrex has been a mainstay in my family’s kitchens for decades. Whether we moved or visited other family in various states, I could always count on seeing Pyrex for food storage. 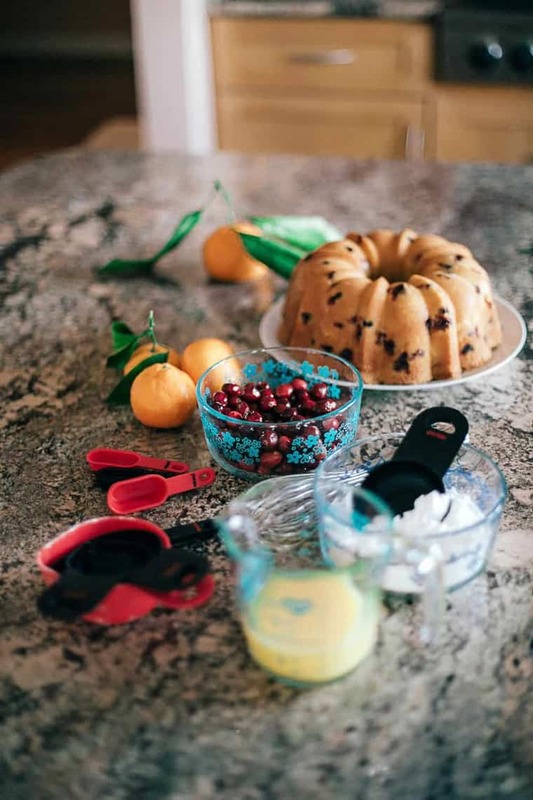 I definitely depended on their new Love Limited edition decorated storage collection for baking holiday gifts with my mom this year (you can shop the new collection HERE with a wonderful discount code: PYREXLOVE20). We decided to bake an orange pound cake together because that’s what we do best. Because I love classic winter flavors, this Cranberry Orange Pound Cake recipe was perfect for sharing with others as a gift truly from our hearts. The flavors are perfect for the season. The tartness of the cranberries is perfectly offset by the citrus and sweetness of the orange flavor. I’m so grateful for products like Pyrex that preserve our heritage and family recipes in a way that I can truly count on. Through the years and through all of my memories, it has always been there and continues to be there for making new holiday memories each year. 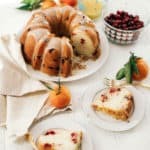 Cranberry Orange Pound Cake - a deliciously moist, flavorful and perfect winter pound cake which is a dream to make all season long. It's one the best holiday cakes you'll ever bake! Preheat your oven to 325°F. Liberally prepare a 12-cup Bundt pan with the nonstick method of your choice. In the bowl of your stand mixer fitted with the whisk attachment, beat the butter for 1 minute on high speed. Slowly add the granulated sugar. Cream together for an additional 5 minutes, until very pale yellow and fluffy. Add the eggs 1 at a time, combining well after each addition and scraping down the sides and bottom of the bowl as needed. Turn your mixer down to its lowest speed and slowly add the 3 cups of flour in 2 batches. Add the salt, baking powder and baking soda. Be careful not to overbeat. Add the sour cream, vanilla extract, orange extract and orange zest. Scrape down the sides and bottom of the bowl and mix the batter until just combined. 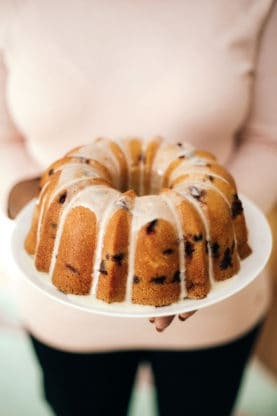 Turn off mixer and toss cranberries with remaining 2 tablespoons with flour then carefully fold cranberries into cake batter. Bake for 1 hour and 15-25 minutes, or until a toothpick inserted into the center of the cake comes out mostly clean. Let the cake cool in the pan on a wire rack for 10 minutes, then invert onto a serving plate. Let cool to room temperature and serve. Whisk together powdered sugar and orange juice until smooth. If it is too runny, add a bit more sugar or if it is too thick, add a little bit more orange juice. You want to consistency to coat the back of a spoon but slide off easily. Drizzle on top of cooled cake and serve. How do I store this cake? Why do all my bunt cakes I make come out really dark on the outside? I bake them the time asked for. It may have something to do with your pan and also where you are baking it in your oven and the temp of your oven. Would I be able to substitute the orange extract for more orange zest or orange juice? I generally don’t enjoy the taste of orange extract. Can’t wait to try this! I love sharing good food with friends and family too. your -orange-pound-cake look so yummy.. This cake IS WONDERFUL! I made it, and it’s just as good as you say it is! Some the pound cakes I’ve baked in the past have not turned out. However, every one of your pound cake recipes come out perfect every time! Thanks so much for sharing! I’m so so glad you enjoyed it!!! I love my vintage pyrex collection…and what great memories tame with your family! This cake would seriously hit the spot right now with my cup of coffee! I love these flavor combo! Amust try winter recipe! This is so pretty! I want a big slice of it today after dinner! I love the combo of buttery and zippy citrus. This is a true beauty! Is it bad that I could rationalize this for breakfast?!? It’s just too good to save as a dessert! I totally could rationalize this for breakfast!! It has oranges and cranberries lol. 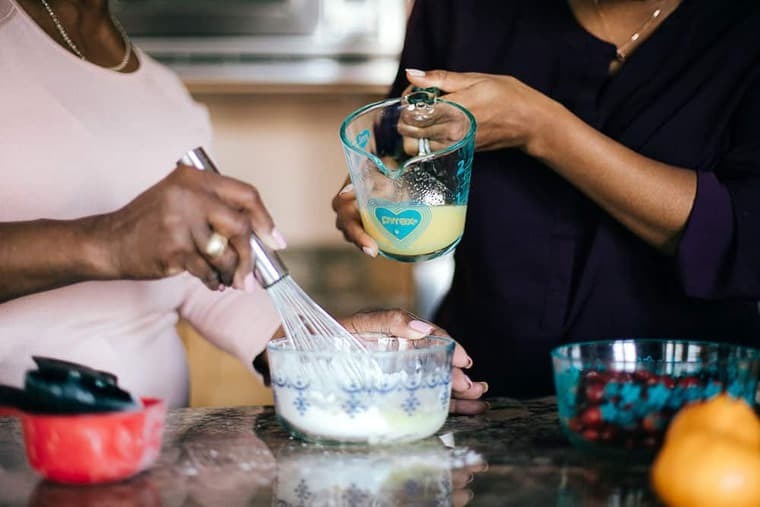 Recipes that have been passed down and memories made baking together are the best! It doesn’t hurt when the end product looks this good! 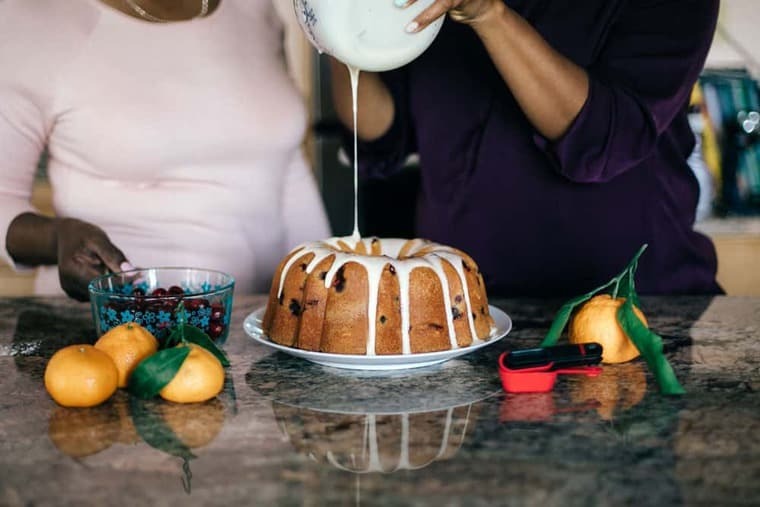 Family recipes and traditions are the best, and this pound cake looks phenomenal!